While there may have been a certain slipshod quality to the book, both as a physical object and in some of the music it contained,3 it could boast of having introduced such quintessential Sacred Harp classics as O. A. Parris’s “My Brightest Days,” A. M. Cagle’s “I’ll Seek His Blessings,” and Paine Denson’s “Peace and Joy” (pp. 546, 542, and 532 in The Sacred Harp: 1991 Edition; hereafter songs mentioned are in the 1991 Edition unless indicated otherwise). It also marked the first appearances in The Sacred Harp of Hugh McGraw, John Hocutt, and Raymond Hamrick.4 The 1960 Edition thus represents a significant milestone: a crucial point of transition, but also one of continuity, between the great Sacred Harp composers of the first half of the twentieth century (Cagle, Parris, the older Densons and McGraws) and those whose names have defined Sacred Harp composition into the present day. As in previous editions of the book, the authors not only sought to emulate existing Sacred Harp musical styles,5 but also turned to established forms of arrangement and adaptation of earlier material. These adaptations provide insight into various aspects of Sacred Harp composition and creative practices. One practice with previous Sacred Harp precedents used by 1960 Edition composers was recasting the melody of an existing minor-key tune in the major mode, or vice versa. Later composers referred to such tunes as major or minor “companions,” the best-known pair being Stephen Jenks’s “North Salem” (p. 440) and John G. McCurry’s “Raymond” (p. 441).6 In the 1960 Edition, S. Whitt Denson contributed “Love Beyond Degree” (p. 567 in the 1960 Edition, hereafter OSH1960), a minor companion to “Mount Pleasant” (p. 218), and “Land of Rest” (p. 484 OSH1960), an abbreviated minor companion to “Westford” (p. 280). Owel Denson wrote “Seaborn” (p. 468 OSH1960), a minor companion to “Fillmore” (p. 434), and “The Love of God” (p. 550 OSH1960), a major companion to “Praise God” (p. 328). The major and minor companions have a value beyond mere novelty: they illustrate features of Sacred Harp musical style in a unique way. 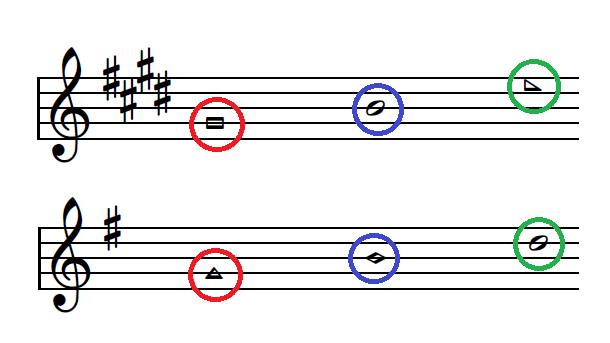 The companion never maintains a note-for-note (scale degree to scale degree) correspondence with the original; the deviations often occur as the composers negotiate differences in treatment between the respective (major and minor) modes. For example, the sixth scale degree (6-fa) is used frequently in major-key tunes but more sparingly in minor-key tunes; conversely, the seventh scale degree in minor (7-sol) is used extensively, the seventh scale degree in major (mi, the “leading tone”) much less so, and virtually never as the root of a chord since its triad (the “subtonic”) lacks the stable perfect fifth interval found in other triads. Thus Owel Denson changes the prominent 6-las in “Fillmore” to 7-sols in “Seaborn,” using the minor-key 6-fa only as a passing tone. Where an original minor-key tune has a stable harmony on the 7-sol (for example, measures 12–13 of “North Salem”), the major companion will transfer the harmony to some other chord, often the dominant (as in the corresponding measures of “Raymond”). Comparison of companions to their models offers a wealth of insight into the respective properties of major and minor Sacred Harp music; writing companions may have been not only a way to generate new material, but also an opportunity for composers to develop or demonstrate their mastery of the Sacred Harp idiom. The opening bars (m. 1–6) of “Seaborn” and “Fillmore,” illustrating their similar melodic contours. 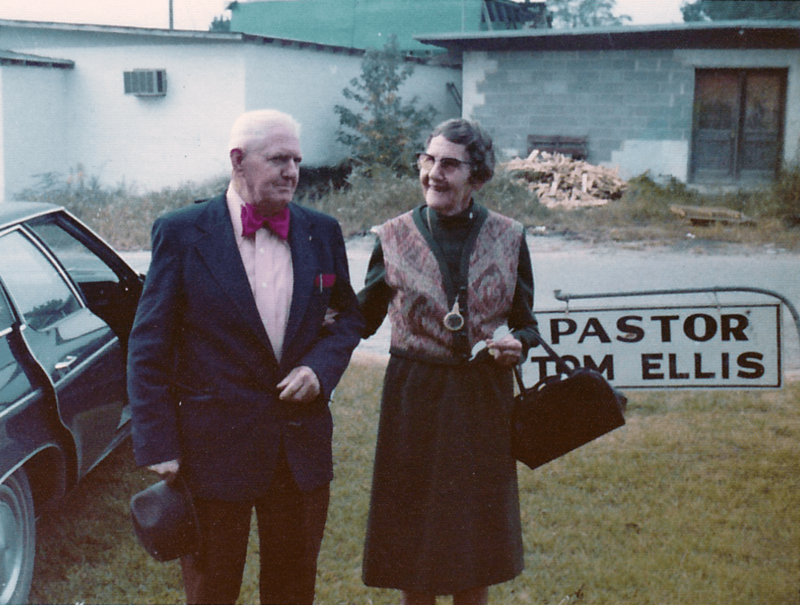 Double first cousins Robert E. “Bob” Denson and Ruth Denson Edwards, 1960s. Photograph courtesy of Michael Hinton. “Alstead” and “The Choicest Blessings” (m. 1–4), illustrating how rewritten versions of New England tunes often had just eighth-note passing or accessory tones added. Another longstanding practice found, rather surprisingly, in the 1960 Edition is the unacknowledged derivation of material from early New England composers.7 “Grace So Full and Free” (p. 494 OSH1960) and “Where Ceaseless Ages Roll” (p. 505 OSH1960), both attributed to R. E. (“Uncle Bob”) Denson, are based on Lewis Edson’s “Greenfield” and Ishmael Spicer’s “Carlisle” respectively. (In the 1966 edition, “Where Ceaseless Ages Roll” was rewritten into its current form—an essentially original tune with only vestigial traces of a relationship to “Carlisle.”)8 “The Choicest Blessings” (p. 575 OSH1960), attributed to S. M. Denson, is Oliver Holden’s “Alstead.”9 The tunes are altered from the originals in a fairly consistent fashion, amounting to a cursory remodeling of all four parts, primarily by the addition of eighth-note passing or accessory tones to original quarter notes. 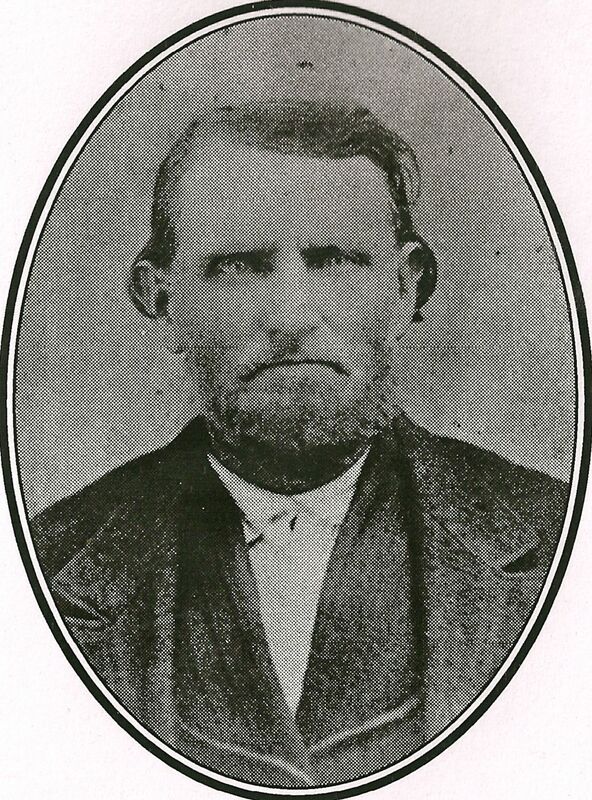 Seaborn McDaniel “S. M.” Denson, Sidney Whitfield “S. Whitt” Denson, and Thomas Jackson “T. 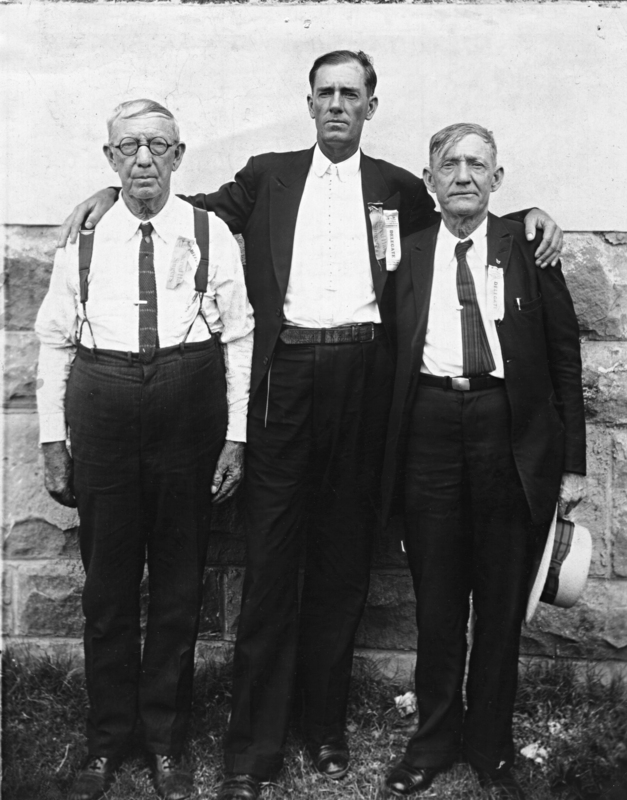 J.” Denson, at the 1930 Young People’s Interstate Sacred Harp Convention in Mineral Wells, Texas. Photograph courtesy of the grandchildren of George Pullen Jackson. Also among the arrangements in S. M. Denson’s manuscript book are those published as “Grace So Full and Free” and the 1960 version of “Where Ceaseless Ages Roll.” These can thus be identified as examples of dedicatory attributions—doubtless considered fitting in light of R. E. Denson’s status as S. M. Denson’s son and a much respected and beloved singer in his own right. The above examples show how the 1960 Sacred Harp perpetuated historical practices of deriving tunes from earlier material. Close analysis suggests that another of its tunes is also derived from an existing tune, but this time in a more distant and unusual way that provides insight into its composer’s creative process and how he may have thought about music. John Hocutt at the 1995 National Convention, Birmingham, Alabama. Photograph by Ginnie Ely. John Hocutt’s tunes, described as “thumping, robust” and “sturdy, cleverly crafted pieces” by Buell Cobb in Like Cords Around My Heart, have quickly established themselves as favorites in all the books where they have appeared. 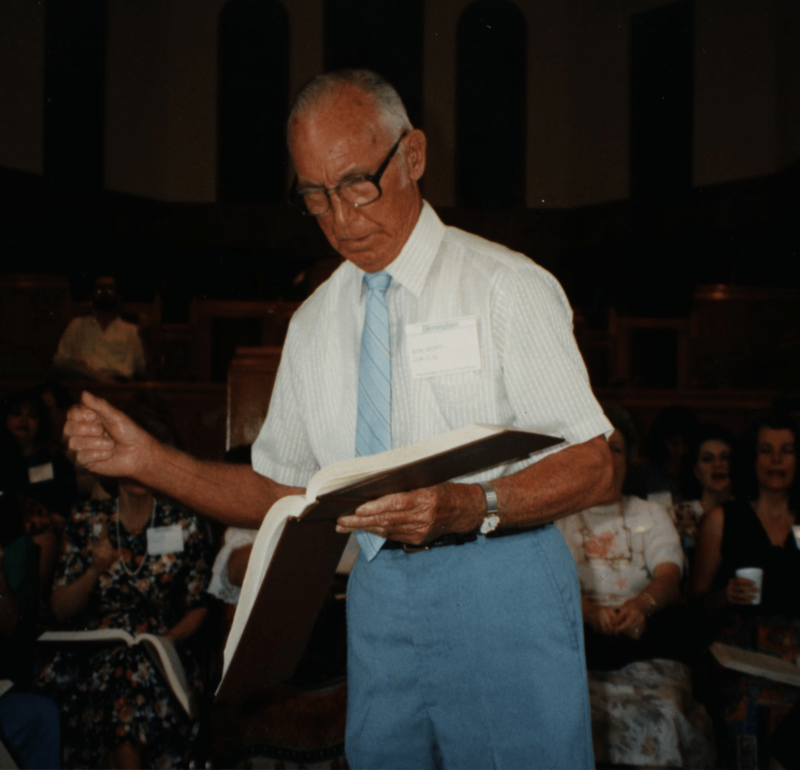 Hocutt also sang Christian Harmony and “new book” music; his compositions had appeared in the 1954 and 1958 editions of Christian Harmony before he contributed three new tunes to the 1960 Sacred Harp. One of these, “The Resurrection Day” (p. 498), shares some unusual features—despite outward differences in musical style and content—with a tune from the 1958 Christian Harmony, John Deason’s “Among That Band” (p. 322 CH2010). The tunes not only have the same peculiar meter15 but are in fact rhythmically identical, except at the end of the penultimate phrase where Hocutt draws out the words “snow white throne.” They also have the same structure of paired voices in the fuging section, with the alto and treble exchanged (in “Among That Band,” the treble, rather than the alto, enters with the bass). Could there be a deeper relationship between the tunes? Hocutt’s re-mapping of the tonic triad in action. “The Resurrection Day” above, and “Among That Band” below. “Among That Band” has a strongly triadic melody—the notes on the first and third beats of each measure are almost entirely from the 1-3-5 tonic triad. To look at it another way, the melodic contour—the rising-and-falling shape of the melody—is articulated on a root-position triad. Hocutt, I believe, has fashioned the melody of “The Resurrection Day” by “re-mapping” the contour of the Deason melody onto a first-inversion rather than root-position triad.16 That is, the 1-doe, 3-mee, and 5-sole17 of “Among That Band” become, respectively, the 3-la, 5-sol, and 1-fa (in the upper octave) of “The Resurrection Day.” While the correspondence (as with the major/minor companions) is not exact throughout—Hocutt applies the re-mapping scheme loosely where appropriate for the new tune—I think the overall similarity of contour, and the triad-to-triad correspondence of at least one entire phrase, are sufficient to suggest that such a “thought experiment” involving melodic structure was the initial seed from which the new tune germinated.18 It is a testament to his skill and grasp of the idiom that, while “Among That Band,” with its varied harmonization, exemplifies a certain type of Christian Harmony style, Hocutt is able in “The Resurrection Day” to turn the remodeled tune into an equally compelling example of a different Sacred Harp style, which quickly found and continues to enjoy a well-deserved popularity. It is perhaps unfair, though understandable, that the 1960 Edition is often remembered today for its failures, its musical content becoming partly inaccessible19 as newer revisions of the book superseded the old, leaving behind only a memory of ink-stained clothes. Its symbolic importance (of which its architects may well have been conscious) as a point of continuity in the lineage joining the 1911 James revision to later editions of the book, including the 1991 Edition, is considerable—all the more so in that many of its living links to the 1911 and 1936 editions, including Cagle, Parris, Whitt and Owel Denson, and T. B. and H. N. McGraw, would pass away in the decade following its publication. At this significant moment in the book’s history, its authors hewed to the classic adage. The music of the 1960 Edition enlarges our understanding of the many ways in which Sacred Harp composers have sought the old paths, to walk therein. David Wright is a Sacred Harp singer and composer from Seattle, Washington. He has been singing since the mid-1990s and has contributed songs to The Sacred Harp: Revised Cooper Edition and The Shenandoah Harmony. This entry was posted in Of Harmony and Composition. Bookmark the permalink.